Tottenham manager Mauricio Pochettino his complaining about his club having to play four games in nine days from the 29 of October to the 6 of November. Spurs having to play 4 games in 9 days after Man City is totally unfair for a teamwho wants to win some titles. The situation has come about, of course, because Spurs had to move City to Mon Oct 29 since they have no stadium. 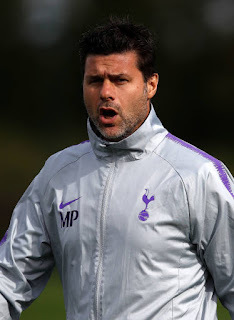 Tottenham Hotspurs will play Premier League Champions Manchester City on October the 29 , which in itself will be a very tough game.The very next day, Tottenham must travel to West Ham United to face them in the League Cup. Then on Saturday the 3 of November, Spurs are away to newly-promoted Wolves, another tough test. To cap off a horrible nine days for Spurs, they then face PSV in the Champions League on Tuesday the 6 of November.